Kathleen is also still for this lamb. 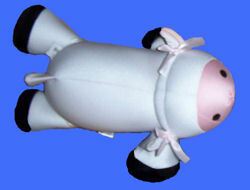 I’m looking for a MOSHI large white lamb with a pink face and black hooves. It has a microbead filling, and it’s 17 inches long. I bought this lamb on an impulse buy. Our daughter was 1 year old, and I thought the lamb was cute. She didn’t take to it right away, but that soon changed. It started by taking “Lamie” to the doctor. It made our daughter feel better about going. We moved when our daughter was 3 years old, and she had to start sleeping in a “big” bed in her new room. It was Lamie that made her feel safe. Lamie travels with us and as you can imagine, she has been washed more times that I can count. Our daughter is now 7 and Lamie is showing signs of severe wear. Our daughter woke up crying one day last week, because Lamie was losing beads (there is a small tear in the face) and some beads fell out and were found in the bed. Tears were streaming from her face at the thought of having to “store” Lamie for safe keeping. I have suggested another stuffed animal but she won’t have it!!! I would like to surprise her with another Lamie. I know it won’t be the same, but I can’t stand the thought of her being so sad. I appreciate your help with this request. Thanks, Rebecca. I’ve contacted both of them. Thanks, Brieanna. I’ve contacted them both. Think this is the lamb. Hey, have you been able to find this plush anywhere? My sister has a big emotional attachment to this toy but it’s also starting to fall apart. I’m unable to buy it from ebay because it only allows International shipping and I’m from Aus. If you have found out how I could buy it please feel free to contact me. Thanks. Anyone still need this lamb? Thanks, Brieanna. There are a few left on this list. Sent today. Do you have the lamb? I would like one.